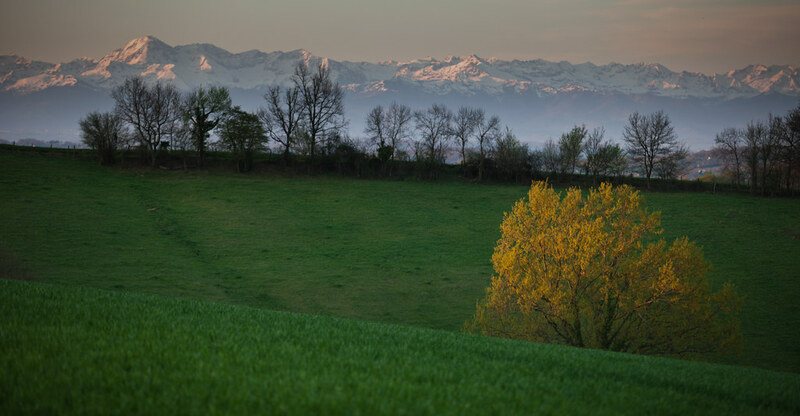 Le Gers is a department (like a county) in the Midi-Pyrenees, in the south of France. Like Tuscany or Napa, it has rolling hills dotted with old farms, fields of colors, horses eating in the misty mornings…like a goddamn postcard. And on the clear days, the mountains dominate the southern horizon. I am around mountains so infrequently that I am awed at what a different landscape it makes. Most of my life has been spent within walking distance of the ocean. Jamie and Suzie are a cool British couple that settled in the area 16 years ago. They have a classic old house that has been renovated, with nice rooms that they rent out. They are both artists and host painting (watercolor) holidays in the summer. As with any farm-ish piece of property, there are always many things to be done. Moved a bunch of logs up the hill. Turned over a couple garden plots worth of lovely clay soil. Dug a couple of holes for big plants. Got to fix a lot of those things that had been bothering Suzie for years: properly installed the wire/lamp in the bathroom that had been poorly done for years, then painted the room. Cabinet door was sagging, so I got it aligned. Magnetic door latch wasn’t holding so I reinstalled it and now the cat can’t get into the food. Replaced a couple rake handles. Got them set up with a new website for the B&B business. Got them off of the old, painful laptop and onto a shiny new iMac. Moved images and music, reformatted the iPod and all the stuff that goes along with such a switch. Busted out a new garden bench for them. This was a fun project. They have loads of great old wood. A huge oak wine press was in pieces. 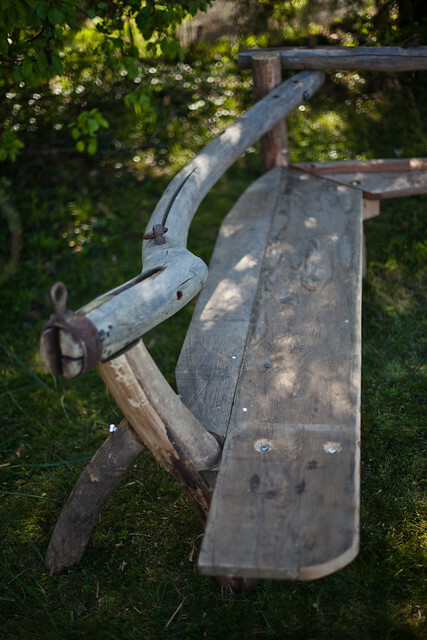 An old ox yoke. Many great pieces over 4×4 and 12 ft. tall. MMmmmm. Part of the ox yoke was two big pieces bolted together, one of them having this great, natural curve in it. 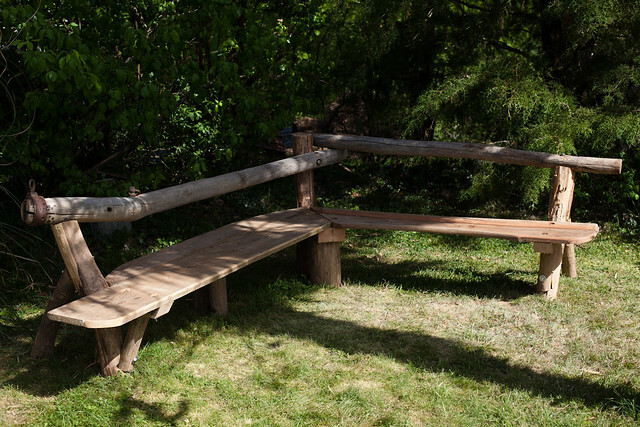 I thought it could easily be bent in such a way to build a big, angled bench. 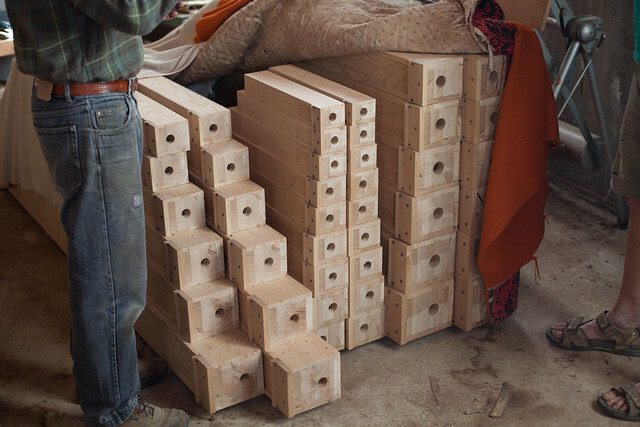 (For some reason, building a big bench has been on my mind for a year or so.) So when Suzie mentioned she wanted one, I jumped at it. Construction was pretty straight-forward, with fine tuning for height and depth. It is very solid and stable and they are looking forward to a summer of evening aperos with friends on the bench. They are right next to Marciac, which is famous for a 2 week jazz festival in the summer. They took me to these impossibly quaint villages and through excellent vistas. Got to me the nice dairy farmers down the road. Once or twice a week, we would trot on down and buy fresh raw milk. I made a bit of butter out of raw cream. Met many of their wonderful friends. There is a good sized contingent of British people there and we went visiting and had some wonderful meals. (Speaking of which, Suzie is a great cook and I feel like I was full for 2 weeks, as in Normandy, the work day is generously interspersed with tea breaks. Oh yeah, and the their friend is a baker who drives around with fresh goods on Tuesdays and Fridays. We had to flag him down a couple of times. It might be the greatest thing in the world. They are excellent backgammon players and I gained some skill there. And the nightly games of Scrabble were sometimes humiliating but always fun. Interesting playing with British people; they have a whole raft of words I have never heard of. “You don’t know what a ‘skibble’ is?! It’s a boy in pantaloons with a 6-pence in his pocket.” So we both learned some new words! So all in all, a good couple of weeks. Now I am even further south, in the foothills of the mountains, with a cool couple I met while in Cambodia. I told them then that I would come here in spring on my way back to the US. So I am doing some web work for them and the usual outside projects. Here for another week and then heading back to Normandy! This entry was posted on Friday, April 22nd, 2011 at 11:23 pm	and is filed under Helpx. You can follow any comments to this entry through the RSS 2.0 feed. Both comments and pings are currently closed.